A collection of advertisements and point of sale signage for retail use. Unless otherwise noted, work includes samples of product and food photography and copy writing for advertisements. BRIEF: Traditional, Coupon, Appeal to St. Patrick's Day crowd. BRIEF: Celebrate the Holidays at McCarthy’s Red Stag Pub and Whiskey Bar. Celebratory toast to the end of a great year. WORK: Copywriting and layout through Adobe InDesign. Photography by Theresa Cantley Consultant. BRIEF: Appeal to car enthusiasts with a taste for Irish caps. 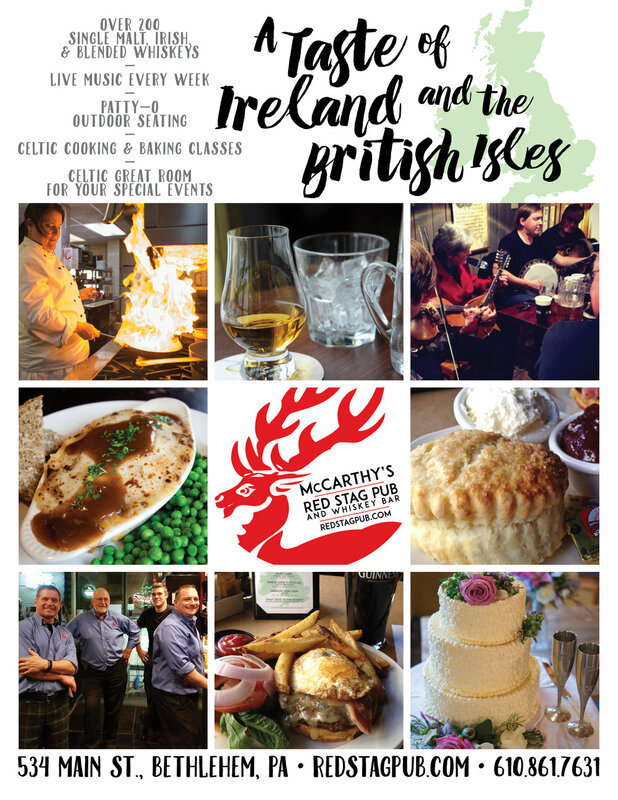 BRIEF: Overview of all that McCarthy's has to offer. WORK: Reworked McCarthy's Logo. Copy writing and layout through Adobe InDesign. Photography of Session Musicians, Scone, and Burger. BRIEF: Advertise first Whiskey Ceilidh tasting festival in 2017. WORK: Copy writing and layout through Adobe InDesign. BRIEF: Mother's Day Belleek porcelain giveaway for Donegal Square's 30th Anniversary celebration. WORK: Product Photography, 30th Anniversary Donegal Square Logo, Copywriting and layout through Adobe InDesign, Photography touch-up with Adobe Photoshop. BRIEF: Promote the newly built outdoor patio for outdoor dining. WORK: Re-worked McCarthy's Logo. Copy writing and layout through Adobe InDesign. BRIEF: Shanore shamrock pendant giveaway for Donegal Square's 30th Anniversary celebration. WORK: Copywriting and layout through Adobe InDesign, Photoshop. Photography by Theresa Cantley Consultant. BRIEF: Advertise and inform about the newly invented "Sconut", a cross between a scone and a donut. Used as a poster in the pub, and as an advertisement on Instagram. WORK: Food photography. Adobe Photoshop and InDesign used to create the artwork. WORK: Copywriting and layout through Adobe InDesign. Stock Photography. BRIEF: Join McCarthy's for Valentine's Day. Highlight Guinness and a more relaxed atmosphere. WORK: Reworked McCarthy's Logo. Copy writing and layout through Adobe InDesign. BRIEF: Traditional, Coupon, Appeal to an Early Spring feel and St. Patrick's Day crowd. BRIEF: Minimal advertisement for Celtic engagement rings. WORK: Copywriting and layout through Adobe InDesign. Photography by Shanore Jewelry. BRIEF: Minimal advertisement for promoting the range of Irish sweaters offered by Donegal Square. BRIEF: Call all Whovians to McCarthy's for an out of this world Doctor Who themed Christmas party. BRIEF: Minimal advertisement for promoting Celtic engagement rings by Shanore. BRIEF: Attract whiskey drinkers to McCarthy's first annual whiskey festival. BRIEF: Promote St. Patrick's Day events happening at Donegal Square during their 30th Anniversary celebration. PLACEMENT: Mailed by Donegal Square to their customer mailing list. Approximately 5,000 pieces.